There are several different types of mustard… you most likely already knew that due to the size of the mustard section in most grocery stores and specialty shops. So many in fact, that at the National Mustard Museum in Wisconsin there are over 5,300 varieties on display! Mustard is a versatile condiment and can vary greatly in both flavor and texture from one to the next. Dry mustard is often called for in recipes as a spice and squeeze mustard is always at hand at the ball park or wherever you see hot dogs. Your favorite mustard can vary with the item that you’re putting it on. Mustard is really a staple condiment. Let’s start with the basics: What is mustard? Mustard is produced by combining the seeds of the mustard plant (either whole, crushed or a combination) with a liquid. Mustard varieties differ due to the type of seeds, the processing and which liquids were chosen for use. Mustard gets its pungent flavor from the oils produced once the mustard seeds are broken. When these seeds are crushed or ground and then mixed with an acidic vinegar or wine, flavor abounds. Most mustards, except for whole-grain mustard, are made this way. 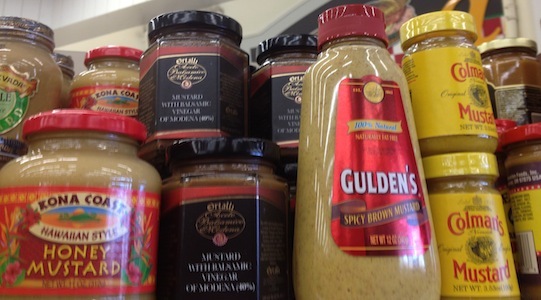 Quickly, a little history on mustard before we get into the different types of mustard. Mustard is one of the worlds oldest condiments, dating back to early Roman cooks, who combined ground mustard seeds with an unfermented grape juice called must to make the hot paste mustum ardens, or “burning must.” This was shortened to “mustard” when the condiment arrived in the English speaking world, but not much else has really changed with mustard over time. Before we get to the chart of mustard types, a little more about mustard and why some mustards are spicy whilst others are mild. The heat level of a mustard depends on the type of seed used to make the mustard, with lighter seeds (yellow or white) being the mildest type of mustard seed and the darker seeds (black and brown) being the hottest seeds. So, mustard color is generally the best indication if a mustard is suited to your taste buds… but not always. 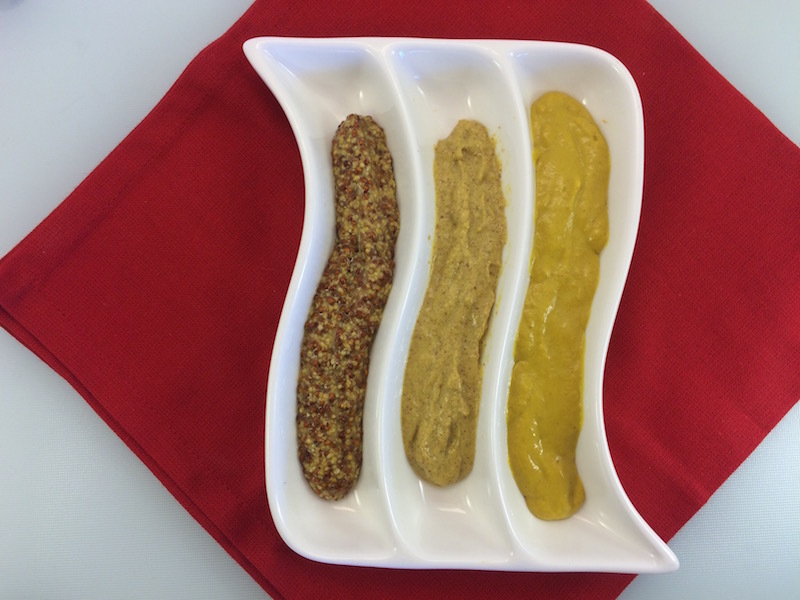 Shown below are whole grain, spicy brown and classic yellow mustards (L to R). The liquid chosen to mix with the seeds also impacts the pungency. When mustard seeds are dried their natural enzymes go dormant and only awake when liquid is added. 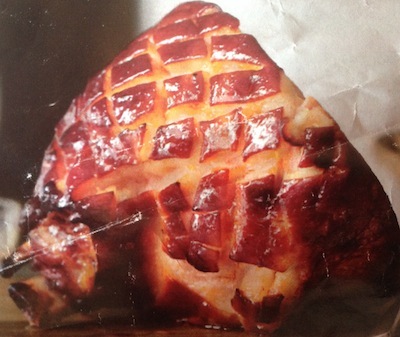 The more acidity in the added liquid, the slower the reaction and thus the longer the resulting heat will last. Therefore, mustards made with vinegar (a highly acidic liquid) will remain spicier much longer than mustards made with water or something less acidic. Dry mustard mixed with cold water will peak in spiciness about 15 minutes after being mixed, but that kick will soon begin leaving the mixture. The temperature of the chosen liquid during preparation will also affect the heat level of the mustard as hot liquids will begin breaking down the enzymes right away and cold water takes longer to do so. Refrigeration stabilizes this reaction, but all types of mustard will gradually lose their heat over time as you get farther and farther away from the best by date. If you’re looking for the longest shelf life when choosing a mustard then go with a bright yellow mustard that was made with plenty of vinegar and store it in the refrigerator. These steps will slow down the decline in mustard heat, but can’t totally stop the process… That’s why many suggest making mustard at home in order to enjoy the most potent mustard possible soon after mixing the powder with the liquid. Let’s rank the mustards by flavor, texture and color. We’ll start mild and build up to the mustard types that pack the most heat. Check our condiment substitution page if you need a substitute for mustard. Here are a couple of variety packs available to sample some more unique types of mustard.